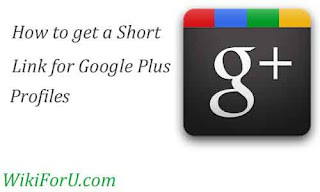 Google plus is a Social network from search giant Google. It's popularity is increasing day by day. People love this social networking project. They want to get invited and some are buying invitations from others. This is How people are going crazy for google plus. As i am also new to google plus, i don't know much more about it. I didn't explore it. But how much that i know, i want to share it with you. And please share this article with your friends by copying url from address bar and then sending it or posting it to social networks. Google plus's users are increasing. Recently i have written an article on : "Google Plus Crossed 10 Million Users" . And now i am going to tell you how you can choose a short url link for your own Google plus profile. Short link has many advantages. With short links you can tell or share your profile page with everyone and also can share easily on internet. Because short links are easy to remember. People can find you easily on internet. And it has it's own importance in Web SEO (You may can't understand it). Go to G Plus Link. In nickname, pick any Nick name that you want. In google plus id fill your ID. You can see in the image that represents id of a google plus profile.